CHICAGO (AP) — Dalvin Cook and Latavius Murray had nowhere to go, all night long. The Minnesota Vikings got pushed around by the Chicago Bears in prime time. 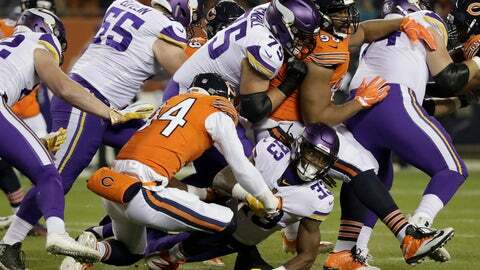 Minnesota managed just 22 yards on the ground while Jordan Howard powered an effective rushing attack for Chicago, sending the Vikings to a costly 25-20 loss on Sunday. The disparity on the ground led to a noticeable difference in time of possession, and Minnesota’s defense looked tired at times, especially in the first half. The Vikings (5-4-1) went 13-3 last season and made it to the NFC Championship game before losing to Philadelphia. But they are going to need some help to take the NFC North again after Chicago (7-3) earned its fourth straight victory in the first meeting between the longtime rivals. Cook finished with 12 yards on nine carries, and Murray contributed 5 yards on four rushing attempts. It was the continuation of a season-long problem for the Vikings, who began the weekend ranked 28th in the NFL with an average of 91.7 yards rushing per game. It seemed as if Cook and Murray had to make a cut in the backfield every time they touched the ball. Left tackle Riley Reiff was beaten repeatedly by Khalil Mack, and center Pat Elflein struggled against Akiem Hicks in the middle. The problems began on Minnesota’s first possession. Murray was tackled by Hicks for a 1-yard loss on third-and-1, forcing the Vikings to punt. Minnesota drove inside the Chicago 20 on its next possession, but Mack forced Cook to fumble and recovered the ball. While Minnesota’s lack of a rushing attack was nothing new, the Vikings had been able to stop their opponent from running the ball. But Chicago gained 148 yards on the ground for its highest total since it rushed for 179 in a victory over the New York Jets on Oct. 28, and the most allowed by Minnesota this season. Howard finished with 63 yards on 18 carries, and Bears quarterback Mitchell Trubisky helped neutralize the Vikings’ pass rush with 43 yards on the ground. Tarik Cohen almost equaled Minnesota’s total for the game when he gained 21 on one third-quarter rushing attempt. “In the first half we didn’t play great defensively,” Zimmer said. “We played a lot better in the second half. Most of it was missed tackles in the first half I thought. The absence of a rushing game put more pressure on Kirk Cousins, and he threw two costly interceptions. Eddie Jackson picked him off in the fourth quarter and returned it 36 yards for a key touchdown.